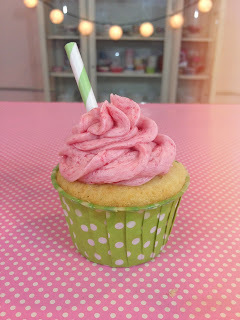 Starbucks Cotton Candy Frappuccino Cupcake! **If you want video instructions click here for my tutorial on YouTube! Alternating from the dry to the wet add into the butter mixture some of the dry then some of the wet and so on until it is all mixed. Bake these cupcakes at 340 degrees for about 18-23 minutes. I find that when I bake cupcakes at 340 degrees it helps the cupcake to bake higher and more evenly. In a mixer mix the sugar and butter until smooth. Next add the vanilla and whipping cream. In a food proccesor or small chopper blend the raspberries until they are smooth and liquid like. Place the raspberries into a strainer and place the strainer on top of a bowl. Using a spoon, start to push down on the mixture so that the juice can separate through. Once you have your raspberry puree you can add this to the vanilla frosting. I used a 2D tip to pipe the swirl and placed a green paper straw in to make it look drinkable!